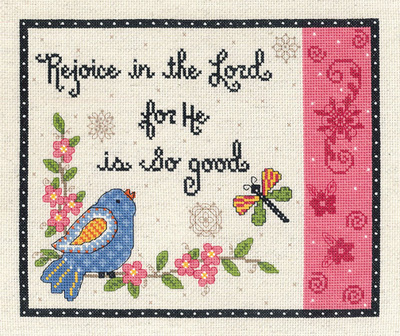 Inspration and beauty with this counted cross stitch design "Rejoice In the lord for he is so good". With pink flowers and birds singing this is sure to be one of your favorites. Contains: 14-count Aida fabric, 6 strand 100% cotton floss, needle, graph, instructions. Size 10"X8"